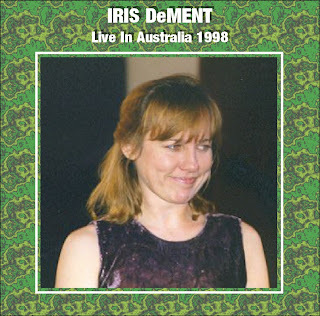 This is Iris DeMent at the East Coast Blues and Roots Festival, Red Devil Park, Byron Bay, NSW, Australia back on April 10th 1998. The performance was subsequently broadcast on national radio on June 14th 1998. Iris DeMent's songs are typically simple, clearly told stories about life's pains and joys. She at times sounds a little like Dolly Parton and occasionally like Emmylou Harris. The songs are superb and in this performance she uses just guitar and piano, which makes for an intimate personal feel. This is the sort of country music I can enjoy, clear of stereotypical songs and falseness, rather just plain simple heartfelt songs stripped back and very roots orientated.